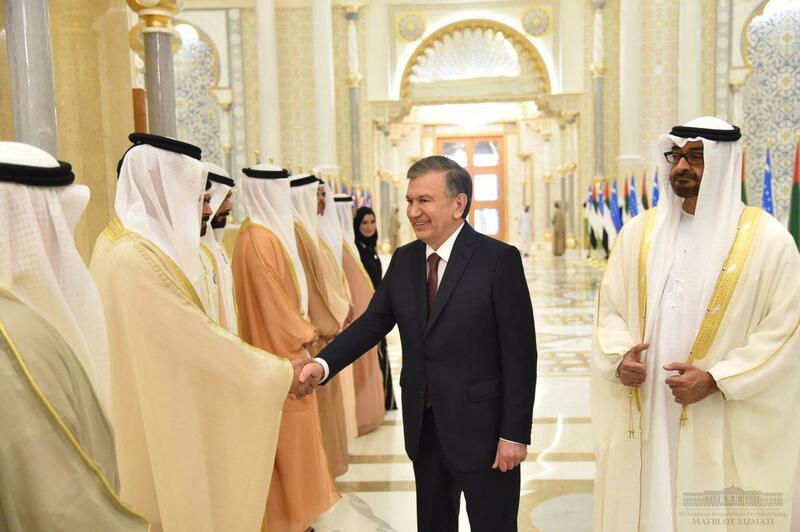 The official welcoming ceremony of the President of the Republic of Uzbekistan took place at the Qasr al-Watan Palace in Abu Dhabi. In honor of the high guest the guard of honor was built. 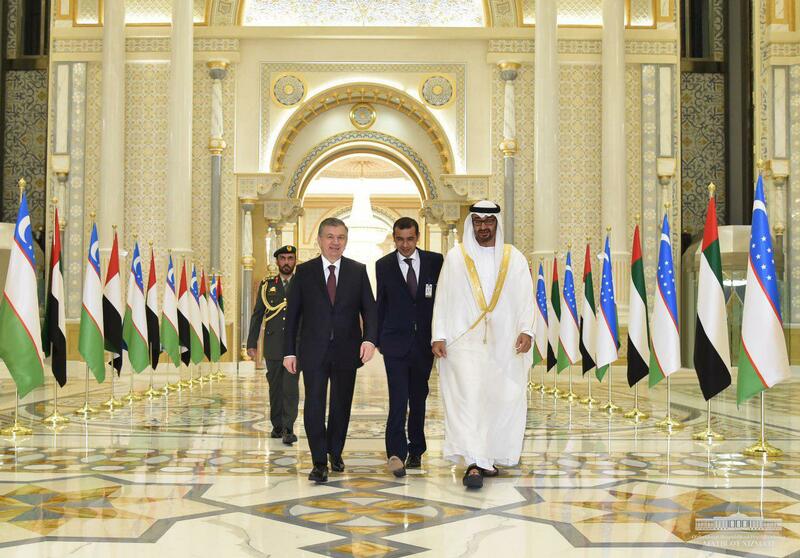 Shavkat Mirziyoyev and Sheikh Muhammad bin Zayed al Nahyan climbed to the podium. 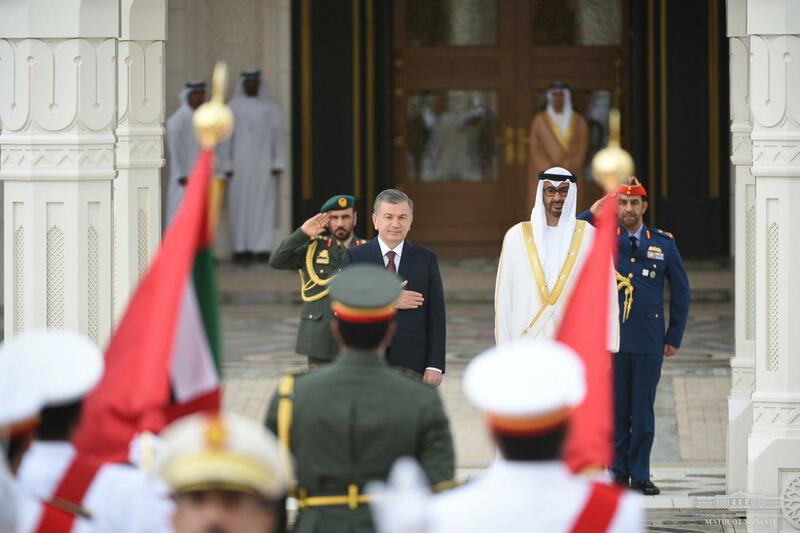 The national anthems of the Republic of Uzbekistan and the United Arab Emirates were played. Then the negotiations began in an expanded format with the participation of official delegations of the two States. Shavkat Mirziyoyev, expressing gratitude for the warm welcome and hospitality, noted the common religious and spiritual values of the two countries, which serves as the basis for the development of bilateral cooperation in the spirit of mutual trust and respect. 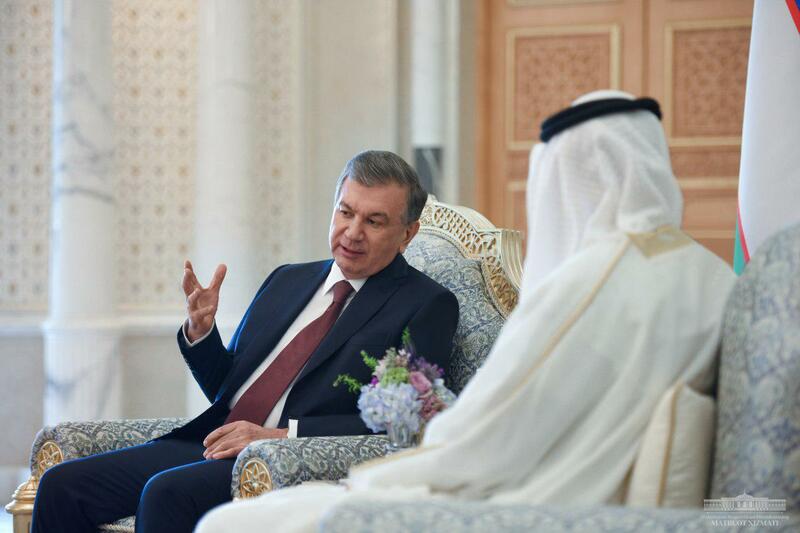 The head of our state stressed that the United Arab Emirates has created a "miracle" in the desert in a short period of fifty years, becoming one of the world centers of economy, innovation, trade, Finance and tourism, and noted Uzbekistan’s interest in cooperation and exchange of experience in these areas. 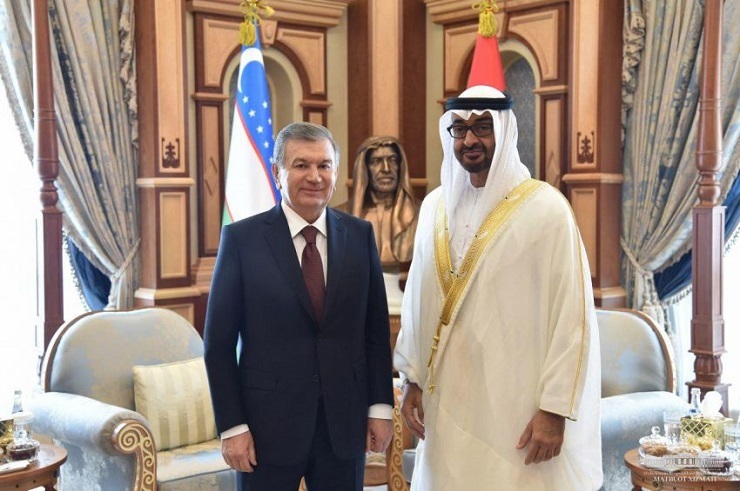 Muhammad bin Zayed al Nahyan praised the ongoing reforms in Uzbekistan to liberalize the economy, improve the investment climate and strengthen the country’s international authority. 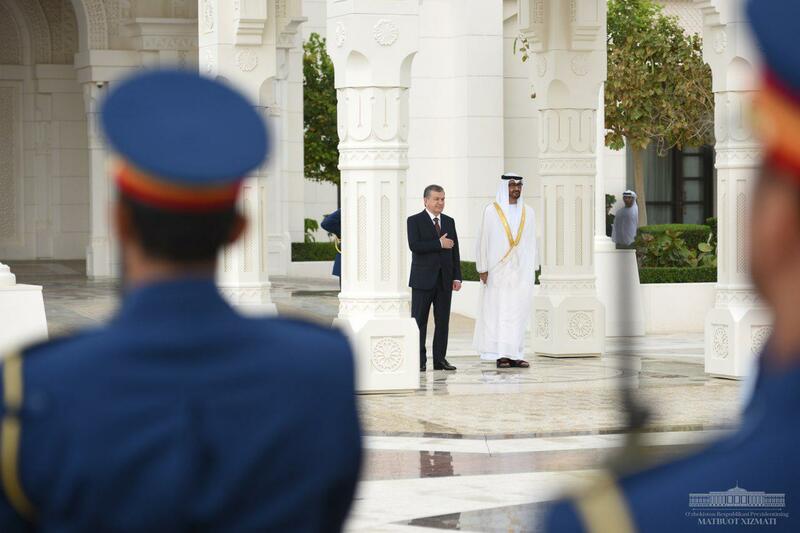 Recall that diplomatic relations between Uzbekistan and the UAE were established on October 25, 1992. For the first time in the history of bilateral relations, the Ambassador extraordinary and Plenipotentiary of the Republic of Uzbekistan to the United Arab Emirates has recently been appointed. Today in our country there are 107 enterprises with investments from the Emirates, 28 representative offices of firms and companies of our country. They are mainly engaged in the production of textiles, building materials, canned fruit, printing, wholesale trade, services. In 2018, the trade turnover between the countries amounted to almost $ 400 million. The head of our state noted that this figure has increased compared to previous years, however, given the potential of the parties, is insufficient. In this regard, the sides discussed issues of comprehensive expansion of bilateral cooperation, strengthening of practical cooperation in trade, economic, investment, innovation, banking, financial, cultural, humanitarian and other spheres. The results of the third meeting of the Uzbek-Emirati intergovernmental Commission on trade, economic, scientific and technical cooperation, held on March 12 this year in Tashkent, were positively evaluated. The task of the intergovernmental Commission is to increase the volume of mutual trade to $ 1 billion in the coming years, to increase the supply of goods, to implement joint projects for the processing of raw materials and the production of products with added value. There is a huge potential for cooperation in the field of tourism. The mausoleums of our great ancestors and the nature of Uzbekistan arouse great tourist interest among the residents of the Emirates. Last year, the number of tourists from the UAE who visited our country increased 1.5 times. In accordance with the recently adopted decree of the President of our country, Uzbekistan has introduced a visa-free regime for UAE citizens. It was noted at the talks that this will contribute not only to the development of tourism, but also to the further intensification of trade, economic, scientific, technical and cultural cooperation between our countries. After negotiations in the expanded structure the ceremony of exchange of the signed bilateral documents took place. 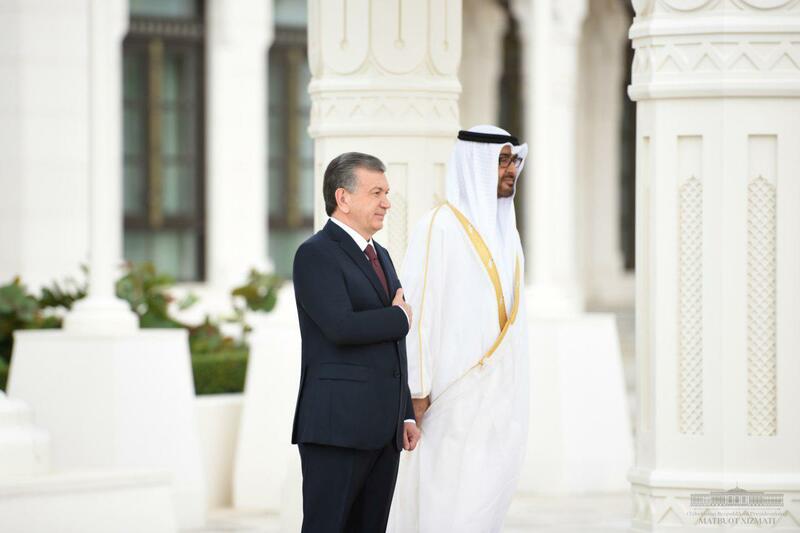 A Joint statement was adopted between the Republic of Uzbekistan and the UAE. The parties exchanged signed documents on cooperation in the field of investment, Finance, alternative energy, industrial and infrastructure development, agriculture, customs administration. It was reported that in General, agreements totaling more than $ 10 billion were reached during the visit. Then President Shavkat Mirziyoyev met with Crown Prince of the Emirate of Abu Dhabi Muhammad bin Zayed al Nahyan in a narrow format. The parties agreed to expand trade and economic ties, implement joint projects in the fields of energy and infrastructure, and strengthen cooperation in science, technology and education. The meeting also touched upon international and regional issues.